A droplet of water freezing from the outside in, shows an exciting series of rapid changes until it violently explodes. Researchers of the University of Twente in The Netherlands unravel this in their paper in Physical Review Letters of February 24. Water droplets that freeze from the outside in, show an exciting series of rapid physical changes before they violently explode. This is shown by University of Twente researchers in their paper in Physical Review Letters of February 24. A perfectly spherical droplet of water that freezes from the outside, forms a shell first. This has the diameter of the droplet. As the shell thickens inward, the remaining water ‘gets a problem’: it wants to expand, but is confined by the shell. After some time, this causes the droplet to explode. But what happens in between? For creating spherical droplets, the UT scientists have placed them on a hydrophobic surface, placed in a vacuum chamber. The temperature is lowered by evaporative cooling so that the droplet is ‘supercooled’: the temperature is well below zero but the droplet doesn’t freeze yet. The first ice crystal is formed by touching the droplet with a silver iodide tip. A skin of ice forms rapidly, thickening from the outside in. The video images show that cracks are formed in the shell, that a peak is formed and vapour cavities are formed underneath the surface. After releasing some ice flakes, the whole droplet explodes in the end. The ice parts have velocities of about 1,5 m/sec. 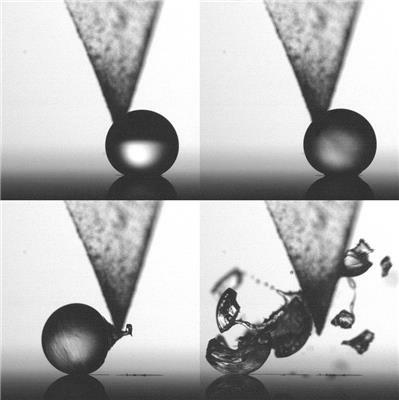 The mathematical model Sander Wildeman and his colleagues developed for explaining this series of events, show that there is a minimum droplet size: below a diameter of 50 micron, no explosion will take place. Meteorologists already know the phenomenon of droplet explosions in the cold tops of clouds. They play a role in the onset of precipitation and can lead to the rapid transformation of a cloud with fluid droplets to a cloud of ice droplets. The experiments have some resemblance to a well-known way to produce hard glass, already known to Dutch glass-blowers in 17th century. Droplets of molten glass, put into cold water, also solidify from the outside in, forming a shell of glass around the melt. They are also known as ‘Dutch tears’. The difference with water is that glass shrinks when it becomes solid. This makes the glass sphere very strong. The research has been done in the Physics of Fluids group of Prof. Detlef Lohse. This group will be part of the new Max Planck - University of Twente Center for Complex Fluid Dynamics that will be opened March 3, 2017. Citation: ‘Fast Dynamics of Water Droplets Freezing from the Outside In’, by Sander Wildeman, Sebastian Sterl, Chao Sun and Detlef Lohse, Physical Review Letters, February 24, 2017.